William Ressler was born on a farm in Lancaster County, Pennsylvania. He graduated from the University of the Arts in Philadelphia. For many years he was a free-lance illustrator and painter with a studio in center city Philadelphia. He is well known for paintings and limited edition prints of Philadelphia, its suburbs, New Jersey shore, and rural scenes. His paintings of Biblical themes have been published world-wide. He has been a long-time exhibitor and award winner in the annual Stone Harbor Art Show, and in galleries in Stone Harbor, Avalon, Philadelphia, and surrounding areas. Since 1990 he has been working from his home studio in Aldan, Pennsylvania. He is a member of the American Watercolor Society and life member of the Philadelphia Watercolor Society. Ressler’s drawings and paintings are included in several private, corporate, and university collections. His painting “Birthplace of Liberty” is on permanent loan to the Governor’s Home in Harrisburg. 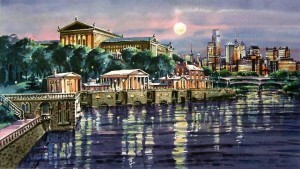 Ressler’s watercolors have been reproduced for a variety of purposes, such as corporate annual reports, porcelain plates in the Franklin Mint’s “Land of the Free” Series, “Tylenol Kid’s Classic” golf art, limited editions prints of historic Philadelphia scenes, and special promotions. Ressler was selected as the American Cancer Society’s Christmas Card artist in 1991. He has won awards in most of Stone Harbor’s Annual Art Shows since 1972 including its 1995 and 1996 Purchase Awards. He was the winner of the 25th Anniversary Wetlands Institute Limited Edition Print competition in 1997. Ressler’s prints and paintings may be viewed in galleries and shows in Philadelphia, its suburbs, and the New Jersey shore. His portfolio could be shown upon request. All artwork on this web site has been copyrighted by the artist. All rights are reserved. You may not copy these images without the permission of the copyright holders. www.WeSellFineArt.com Presented by Pine Ridge Productions, Inc.